Tree peony blossoms in a Chinese vase. NOTE: This interview with artist Vladimir Kanevsky was published back in March 2010, and I post it again as a virtual thank-you note. 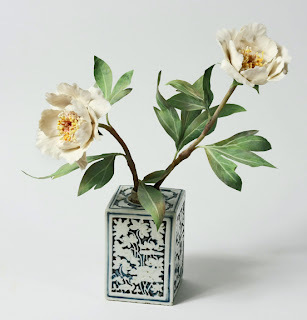 Yesterday a large box arrived at the post office and tucked inside, wrapped in mounds of tissue paper, was a branch of tree peony, adorned with two lustrous pale-pink blooms made of the most delicate porcelain. So fragile did it seem that I was afraid to set it down for awhile, so instead I walked around the house with it cradled in my arms until I could find a safe display location. Vladimir, thank you for this extraordinary evocation of eternal spring. And dear readers, I will be rebuilding the AAL archives a bit at a time, so please forgive me if some of the articles posted now and again are ones you've already read. Auriculas in antique porcelain cachepots. If Madame de Pompadour were alive today, the taste-making mistress of French king Louis XV would surely be haunting the Fort Lee, New Jersey, studio of artist Vladimir Kanevsky. The Ukraine native’s specialty is magical flowers, each an elegant, naturalistic composition of hand-painted porcelain and tôle, all of them in small editions. 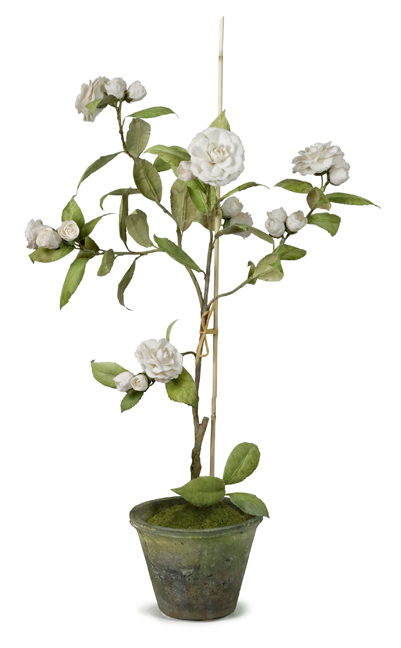 These meticulously crafted artificial plants, in fact, are very much what was in vogue at the French court in the mid 18th century, a place where exquisite artifice held center stage in art as in life. The melon was a success and for several years Kanevsky worked almost exclusively for Slatkin & Company, the designer's glorious little shop on East 70th Street in New York City, now since closed. In the years since then Kanevsky has been laboriously cultivating a garden of earthly delights under The Vladimir Collection marque—gooseberries laden with soft green fruit, a rose bush dappled with blossoms and rose hips, a camellia tree tenderly tied upright to stake, a hydrangea whose broad leaves bear evidence of nibbling insects. Delicately painted porcelain dahlias raise their fluffy heads above blanc-de-Chine cachepots, and fruiting strawberries emerge from handmade terra cotta vessels smudged with moss. Kanevsky’s work also includes handcrafted tableware, from leaf-like dinner plates in the style of 18th-century Chelsea ware to tureens shaped like blue-ribbon cabbages. The brilliance of his work has attracted legion collectors, including fashion designer turned entertaining maven Carolyne Roehm and interior decorators Howard S. Slatkin and Charlotte Moss (she bought his first lily of the valley). Prices range from $95 for tiny plates measuring 3.5 inches across to $4,800 for a tôle-and-porcelain arrangement of three hyacinths in a ribbed pot, one bloom hosting a delicate butterfly. Custom-made items are priced differently. To see Kanevsky’s offerings and place orders, click here to visit the website of The Vladimir Collection. White porcelain hydrangeas in a terra cotta pot. An Aesthete's Lament: Vladimir, you are one of the world’s preeminent flower sculptors but people might be surprised to learn you started out as a modern architect. Vladimir Kanevsky: City planning was one of my specialties, and I designed several new districts in Saint Petersburg, where I moved from Ukraine. I still do a bit of architecture; I designed a villa on the Black Sea for a client. I also designed a neighborhood in Moscow but somebody else developed it. My life is nearly all about the flowers now. AAL: You’ve come a long way since the days of using your stove as a makeshift kiln. How many workers do you have in your studio? VK: About five people, who do technical work. Unfortunately I cannot delegate; I like to control everything. My wife, Edita, and I always quarrel about whether we should hire more craftsmen. I always refuse because I like to work with my hands, not to teach people. That is why I quit architecture. I like to touch things and feel things. I enjoy shaping and painting. AAL: Your own preference is for modern sculpture, and you have spent many years sculpting nudes in bronze. 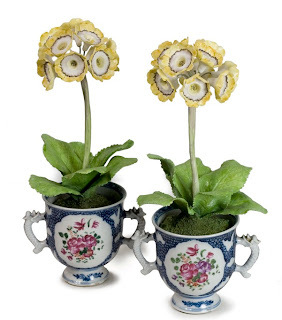 So why focus on porcelain flowers? It’s so dix-huitième. VK: I think the flowers connect my modern side with my retro side. Someone from the Cooper-Hewitt Museum came to my studio one day and said my flowers are traditional in concept but that they are modern because of the context. Which I think is true. I’m not making them for kings; I’m making them for modern people who put them in contemporary surroundings. A camellia tree in an antique Chinese ceramic vessel. AAL: Where do you get your ideas for the flowers? VK: Everywhere—seed catalogues, paintings, books. For a collection I showed at Bergdorf Goodman I used Carolyne Roehm’s book about flowers [A Passion for Flowers] and studied the photographs very closely. She actually came to the show, recognized what I had done, and bought nearly the entire show! I was stunned. It was a perfect circle. AAL: You’ve been working a lot with old containers recently, ones clients have supplied. Why is that? VK: I don’t like making the same things all the time, so this way I can make special custom-made arrangements only for that client and that container. It also gives me an opportunity to participate in a dialogue. It’s a lot of fun to do. The flowers and the container have to look right together, like they are married. 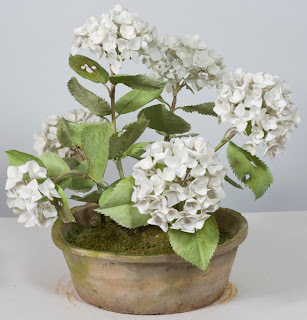 I made some flowers for the Chinese Porcelain Company using old Chinese containers, and it was an incredible positive working experience for me. The camellia I made for one container was too big, so I had go back and look at the relationship all over again, to remove some branches and make the arrangements smaller until the container and the flowers were in balance. AAL: Working with old containers must inform your craft too. VK: The great thing about working with old containers is that I can study them closely, especially antique porcelain ones. It helps a lot in my understanding of 18th-century painting and glazes and to keep that tradition going. A group of Kanevsky designs, including a cabbage soup tureen, a potted lily of the valley, and Chelsea-style leaf platters. AAL: So you are always looking back in time. VK: I love European porcelain of that period very much. Not only does it have a wonderful history, it is very playful, it has life. 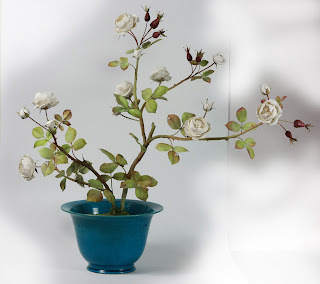 It’s not just a model of something, a reproduction of a flower. It’s a sculptor’s idea of how a flower should look, so it has more personality than just a perfect copy. I also study Soviet porcelain too, especially propaganda porcelain of the early 1900s, which can be excellent. Very avant-garde artists of the time were commissioned to paint and sculpt. Sometimes they used porcelain molds made before the Revolution but would use them to create radical figurines and china. 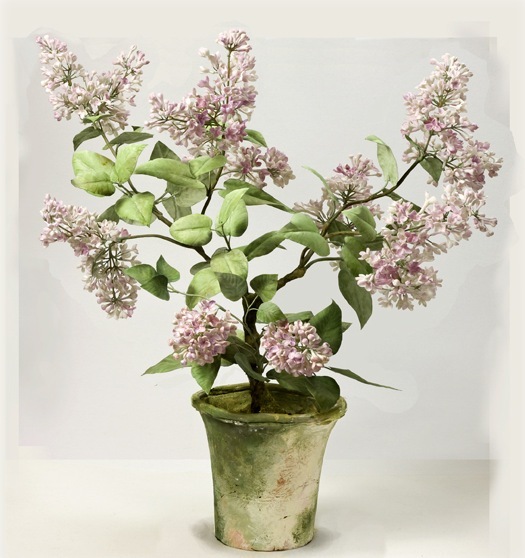 A lilac bush in a terra cotta pot. AAL: Tell me about one of your recent commissions, a rose bush, which you did for a friend of mine. VK: She helps me a lot, actually, sending me seed catalogues and photographs of things she has seen that might inspire me or showing me old pieces of porcelain I can study. Her taste is impeccable. Originally she wanted a lilac but the lilac I make is very elaborate, with a thousand little flowers. She wanted something simpler so we discussed making a large rose bush with several large white roses instead; I placed it in an old English terra cotta pot. AAL: Your latest catalogue is incredible. I’ve looked at it practically every night since it arrived. VK: What’s pictured in the catalogue is often different that what’s available in the studio. I make a lot of special flowers just to sell in the studio, items that are one of a kind. AAL: What are you working on now? VK: I’ve started making chandeliers, unusual ones. One of them is shaped like a tomato plant. AAL: If you ever start to explore weeds seriously, give me a call. I would like an arrangement of Queen Anne’s lace or cow parsley. VK: Weeds would be a very different niche! A Chinese rose in a blue ceramic vessel. 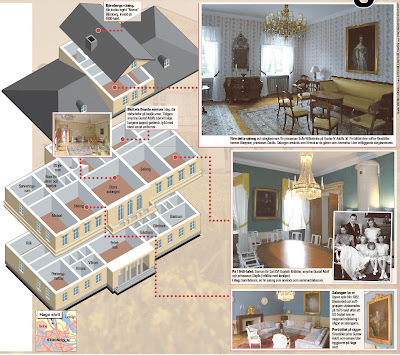 A cross-section and photographs of Haga Slott, the new home of Crown Princess Victoria of Sweden and her husband, the former Daniel Westling, now Prince Daniel, Duke of Västergötland. The image above was published in the Swedish magazine Aftonbladet and posted on the blog Trond Norén Isaksen. The main façade of Haga Slott. Modesty is deeply attractive quality. Especially when it comes to royalty. And few dynasties seem to be as laidback as the Bernadottes of Sweden. After all, how often does one see a gay couple waltzing at any wedding, let alone a royal one, as happened at the wedding reception last weekend of Crown Princess Victoria and her husband, the former Daniel Westling, now HRH Prince Daniel, Duke of Västergötland? Friends of the bride and groom, the couple in question was pop singer Peter Jöback and his partner, gym instructor Oscar Nilsson, and the men, each dressed in faultless dinner jackets, danced amid a bevy of glittering crowned heads also tripping the light fantastic. The Crown Princess's choice of post-nuptial residence is as easygoing as her homey yet elegant wedding turned out to be: Haga Slott, one of the loveliest houses in the possession of the Swedish royal family and much less well known than its near neighbor, Haga Pavilion, built in the eighteenth century and famous for its ravishing painted-metal tents. Though the name of the couple's new home translates to Haga Palace, it is really a charming villa in the Italian style: three stories tall and quietly neoclassical, completed in 1805 to the designs of architect Carl Christoffer Gjörwell. Originally meant to house the young children of Gustav IV Adolf and his wife, Frederica of Baden, Haga Slott is rather small in comparison to other buildings bearing "palace" in their names. Made of brick clad in stucco and incorporating marble columns salvaged from a burned-out church, it was given to Crown Princess Victoria as a wedding gift by the Swedish government, who had long used it to house distinguished guests. 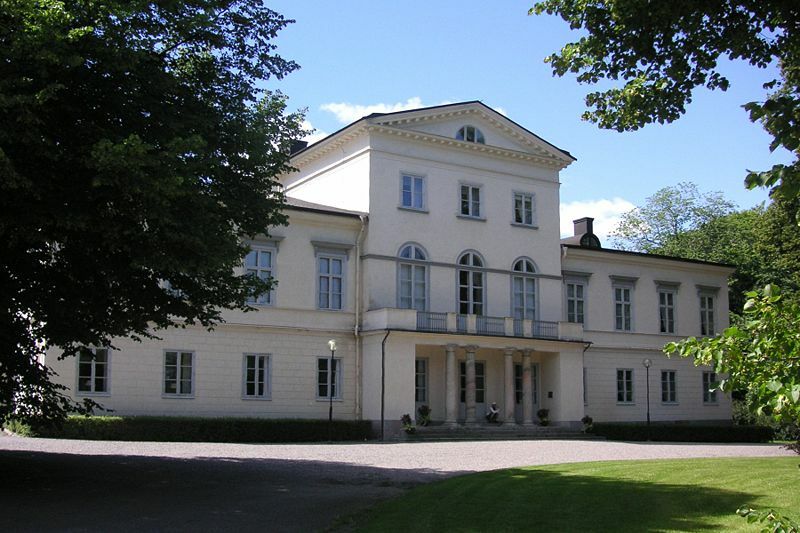 Modest in scale, restrained in its details, and friendly in appearance, Haga Slott is a house I'd be quite happy to call my own. Though I would paint the exterior a warm shade of goldenrod and freshen up those rooms with masses of flowered chintz and a few deep-dish armchairs. The floor plan of Haga Slott, from ground floor (far left) to second floor (far right). 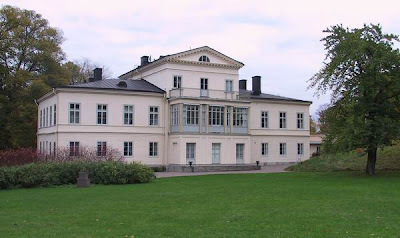 The rear façade of Haga Slott, near Stockholm.